Two types of two-seat aircraft were mainly used to provide aerial reconnaissance in the Austro-Hungarian air forces. 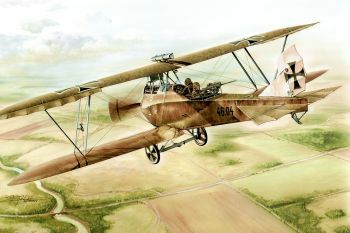 They were the Hansa Brandenburg C.I and the efficient Lloyd C.V aircraft. This sleek aircraft was exceptional with its plywood covered wing structure. The kit contains two sprues with gray plastic parts, highly detailed resin and photo-etched parts for cockpit and engine. The decals offer three machines in original colors (plywood and linen) but also a camouflaged one.